Hi, GO! Getters! It’s Gina from Gem Hill Quilts! In my mental calendar, February glows pink or red and it's just a wonderful time to celebrate loving hearts. Double Hearts is a quilt of, well, hearts! At 40" square, it is just perfect to use as a sweet baby quilt, a signature quilt to celebrate a birthday or wedding anniversary or just a wonderful surprise gift for your beloved. The Ready. Set. GO! includes the AccuQuilt GO! Fabric Cutter, the GO! Qube Mix and Match 8” Block, the GO! Strip Cutter-2½" (2" Finished) and more! Really, all you need to do is JUST ADD FABRIC. On the AccuQuilt website, you can view videos and download free patterns and guides to help you make fabulous quilts faster than before. One such download is the free GO! Qube 8" Block-72 Block Patterns Booklet (MMQUBE8). From this booklet, I used the GO! Double 4-Patch 8" Block Pattern described on page 21 and the GO! Double X, No. 2 8" Block Pattern described on pages 24-25 to make Double Hearts. For the color scheme, I chose shades of pink. Do you see that light background fabric? Yes, it is directional! It was not difficult to deal with the directionality. All you have to do is lay out each unit or block before sewing to verify that the print is going in the right direction. The funny thing is, because I was aware of the directionality of the background, I even saved myself some "unstitching" by spotting early a patch that had been rotated incorrectly! Also needed are ½ yard for Binding, 1¼ yard Backing and 46” x 46” Batting. An obvious use of this strip cutter is cutting binding. It's easy enough to cut strips to sew together into a binding strip. However, I actually prefer to use bias binding and though it may surprise you, this strip cutter can be used to cut bias strips as well. So, view the following video to learn how to cut bias strips for binding. This is such a time saver! A less obvious use of this strip cutter is to cut 2” finished squares! Yes, squares! Can you believe it? Watch the following video to learn how. Isn't that fantastic? I find that this technique is really useful if you are cutting a lot of Shape 2 squares as in the case of the Background fabric and even the Light Pink fabric. As I noted above, this block is straight out of page 21of the GO! Qube 8" Block-72 Block Patterns Booklet. Follow the directions in the booklet or below to complete these blocks! Sew two Shape 2 Light Pink squares with two Shape 2 Background squares to make a 4-Patch. Make 24, 4-Patch units. Layout two 4-Patch units with two Shape 1 Background squares. 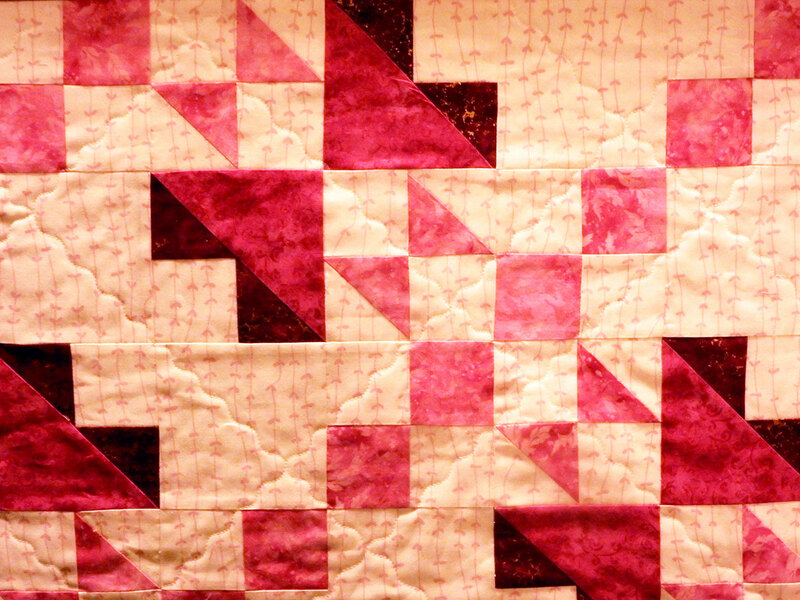 Sew together to create a Double 4-Patch block. Repeat to make 12 blocks. Once more, this block is straight out of pages 24-25 of the GO! Qube 8" Block-72 Block Patterns Booklet (#MMQUBE8). Follow the directions in the booklet or below to complete these blocks! Sew a Shape 5 Light Pink triangle with a Shape 5 Background triangle to create a 2” Finished Light Pink/Background Square. Make 52 of these. Lay out and sew two 2” Finished Light Pink/Background Square with two Shape 2 Background squares to create a 4” Finished Light Pink/Background Square. Make 26 of these. Sew a Shape 5 Dark Pink triangle onto two adjacent sides of a Shape 2 Background square to create a Dark Pink/Background triangle. Then, sew a Shape 3 Medium Pink triangle with a Dark Pink/Background triangle to create a 4” Finished Heart Patch! Make 26 of these. Finally, lay out and sew two 4” Finished Light Pink/Background Square with two 4” Finished Heart Patch to make a Double X, No. 2 Block. Make 13 blocks. Layout the Double X, No. 2 Blocks, alternating with the Double 4-Patch Blocks in a 5 x 5 Setting. Sew Blocks within each row together. Then sew rows together to complete the quilt. Layer the quilt top with the batting and the backing to create a quilt sandwich. Baste with pins or temporary adhesive spray. Machine quilt as desired! My quilt has simple diagonal wavy line quilting on the background fabric. To show some of the quilting lines, I had to take this dark picture of the quilt full of shadows that highlight the stitch lines. Baste along the edges of the quilt within a ¼” of the raw edges. Trim along quilt edges. Prepare the binding strips and attach the binding to the last ¼” along the edge of the quilt. This way, you don't cut off the points on the Blocks. Don't forget to add a pretty label to your Double Hearts quilt. Hopefully, you enjoyed this tutorial and learned some new tips and tricks! For the experienced quilter, GO! Qube 12" Pieced Heart Quilt Pattern. For the beginner, GO! Piece of My Heart Strip Quilt Pattern. For anyone looking for a quick project, GO! Scrappy Heart Mug Rug Pattern. And don't forget to follow us on social media for the latest patterns, die releases and sales! Check us out on Facebook, Instagram, Twitter, YouTube or Pinterest! Topics: GO! Project Tutorials, Ready. Set. GO!